Its drama time again! 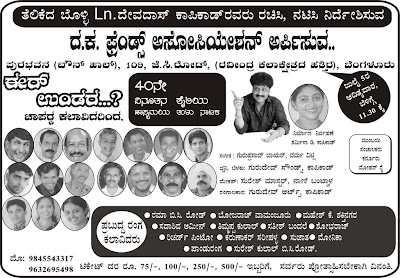 On Sunday, July 5, 2009, Bangalore audience can witness Tulu drama, Eer Undara? (means to ask - Had your meals? in Tulu). Directed by 'Telikeda Bolli' Devadas Kapikad, popular name in Tulu theater, this drama promises to be a laugh riot like his previous plays. Here, are the other details of the play. Blogging for 3 years now!